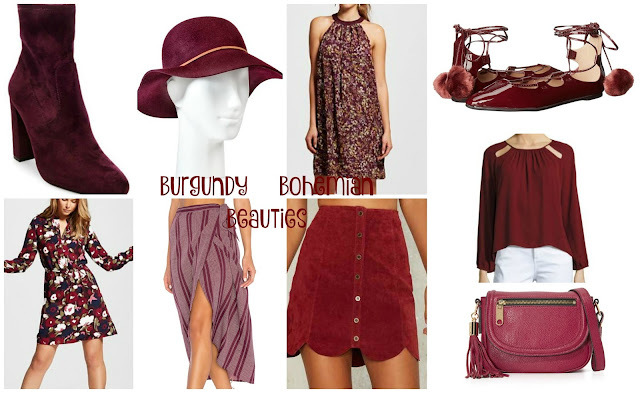 Burgundy Bohemian Beauties and Linkup. Every year Fall rolls by, there is one color that captivates me with its rich, robust beauty: Burgundy. Also known as Merlot, Bourdeaux, Maroon, Oxblood, Marsala, etc. Whatever you want to call it Burgundy is one of the IT colors of Fall, alongside Olive Green. I have been more and more into Bohemian styles lately and I'd love to add some Burgundy Bohemian Beauties (like in the collage below) to my closet. I was supposed to have a brand-new outfit featuring a brand-new Burgundy Leather Jacket I purchased during Nordstrom's semi-annual sale, this year, but I had a very busy and late Monday at work and I wasn't able to edit my photos on time. This week you will see a lot of Burgundy in this blog. Today, I decided to compile some of my favorites in a collage. Read on below to see how I'd style them. Floral Shirt-Dress - this is more like a work dress, so not your 'typical' Boho dress, but pair it with the gorgeous laceup patent leather flats and you add a touch of Boho to your work look. When you are out and about or to Sunday brunch, add the floppy hat, too. Suede Booties - isn't this pair so pretty, classy and versatile. They are the type of boots that can be dressed up or down, again not particularly Bohemian but worn with a Chambray Shirt-Dress or Off-Shoulder Dress and some Tassel Earrings, they make such a cute Bohemian Outfit. I am eyeing and want to purchase them. I love the mid-calf length. Striped Midi Skirt - how beautiful is this skirt? The length, duo color stripe-pairing of two different burgundy tones, and wrap style make it so classy and feminine. For a Classy Bohemian Outfit, I'd pair it with the booties from this collage, an Ivory Off-Shoulder or Cold-Shoulder blouse embroidered with red or burgundy flowers and a Sparkly Statement Necklace. Floppy Hat - another item I want to acquire for Fall is a Burgundy Floppy Hat. Seriously you can add this to any outfit and automatically it becomes a little Boho. Button-Front Skirt - a mini skirt with buttons on the front in a sude or suede-like material always translates so well into Bohemian outfits. For a monochromatic look, I'd pair it with the Peasant Blouse from the collage and the Patent Leather Flats. You could add the hat if you like. This skirt would pair well with a Dark Floral Button-Down Blouse too (tucked in) and the booties - here you got two Bohemian Looks with this Adorable Skirt. Floral Halter Dress - I love how subtle the burgundy looks here paired with mauve, blush and light pinks. It is a floral that is not in your face so you can add some Bold Statement Earrings and dress it up with some Laceup Wedge Booties. For a more dressed down look, opt for the Suede Booties from the collage and a Burgundy or Olive Green Open Grandpa Cardigan. Saddle Bag - this particular saddle bag is perfect. I love the Rich Leather and it is the perfect shade of Burgundy. You can seriously add it to all of the outfits I have described so far. I think it would particularly look great with both Skirt Outfits. Peasant Blouse - an Interesting Blouse with shoulder cut-outs which can be paired with Cropped Pants, BF Jeaans, Skinny Jeans, Midis, Mini Skirts and A-line Skirts. Besides the outfit I described above (with the Suede Button-Front Skirt) I'd pair it with some Black or Gray Distressed Jeans, the Flats from the collage, the Saddle Bag and a Long Tassel Necklace. Burgundy Laceup Flats - possibly my most favorite thing in the collage and seriously these Patent Leather Pom Pom Flats go with everything and the price is a steal! I think these would be a great addition to your Holiday Looks come December too. They are classy, girly and bohemian. Here is a recent Bohemian Look I blogged about where I have used several of the elements like in the collage above. I mixed a Bohemian Patterned Dress which has Bell Sleeves with a Burgundy Duster Trench Coat, Fringe Block Heels, a Floppy Hat and a Saddle Bag. It is the perfect combination of Pink, Navy and Burgundy. Before I leave for today, I wanted to invite you all to linkup below. It is my pleasure once again to co-host with my friend RACHEL from Garay Treasures her fabulous "Bloggers who Have Inspired Me" linkup currently live. Join us and make sure you linkup with the Lovely Rachel every Tuesday. Now it's time for "Bloggers Who Have Inspired Me" link up: Meet your Host: Rachel of Garay Treasures blog: Rachel is a former full time preschool special education teacher turned full time stay-at- home mom of four children with a passion for substitute teaching and blogging at Garay Treasures on the side. Garay Treasures is a fashion and lifestyle blog with some added posts on faith and everyday treasures. Rachel loves drinking several cups of coffee a day (hot or iced), blogging, and reading and playing with her children. You can follow Rachel by bloglovin, Instagram, Twitter, Facebook or Pinterest. "Hi, I am Ada and I blog at Elegance and Mommyhood. As a busy working mom to a 3-year old and a wife, I am always running into a million directions. It is always important to me to feel and look good and I do so in a budget. Sale aisles, coupons and retailers like Target are my friends. I have proved through the 4+ years I have been blogging that you don't have to spend a fortune to look like a million bucks. Not all of us can afford Nordstrom, Bloomingdales and J.Crew on a daily basis and that is alright. So welcome by to see how I style my loving wardrobe and my daughter Vivian too. I can be found on Bloglovin, Instagram and Pinterest. Thank you for having me be your co-host once again, Rachel." I was inspired by Sarah's choice in naming this shirts color. While this is a random inspiration I find myself calling items in this color by that name. See what she named the tee color here. Also find out from that same post 4 Fall colors to wear now. Lizzie's post on "You Know Your A Fashion Blogger When" post was a fun read and had me proclaiming "AMEN!" at most all of them. Check out the post here for a good smile or laugh. I found Lisa's story of overcoming anxiety and pain just inspirational and you can find that post here. Jill's story is equally as inspirational on her journey through the beginning stages of Breast cancer. Find out more here. ChiChi's take on silver jewelry and her outfit are remarkable here. 2). Please follow your host: Rachel of Garay Treasures either by Bloglovin, Instagram, Facebook or Twitter or all. Comment below and let me know how you are following so I can follow back. 3). Stop by and check out the other bloggers who have linked up and be inspired. 4). Have fun! Comment below if you have any questions! Thanks for linking up!